You can see the beauty of mutual support, surrender, listening, and communicating through the body. Note the spontaneous responsiveness in each moment between these two skilled Contact dancers. People come to dance for many reasons. Some are looking for social connection and community, some are looking for outlets for self-expression, some are seeking avenues to experience the exhilaration and joy of moving their bodies freely and authentically with others of like mind. If you are interested in learning Contact Improv, but feel anxious or intimidated about the form, I'm your girl. To avoid injuries, emotional or physical, it is very important to learn with a seasoned person, rather than another beginner. I provide a safe, private, focused environment where you can learn the basics at your own pace, with fun, ease, and support. Depending on your personal learning style, we work more from structure, or more from flow; and fluidly from one to the other. Both will be integrated into your contact improv moving skills. 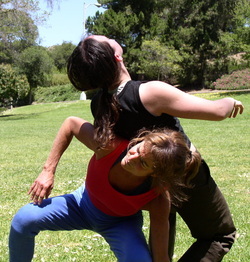 Contact improv is all about close physical partner dances that are fun, pressure free, and consensual. CI is deeply connecting. Ci will teach you how to totally inhabit your body and move by yourself, and with others with focused awareness. As you work with me, you will learn the core principles of what makes CI 'work'. You will learn how to move your body in more functional, grounded, supported ways, how to be strong yet soft simultaneously, how to develop a deep sense of trust in your own body, and how to 'trust' others. I will teach you ways to invite and sustain connected dances even with those unfamiliar with the form. Contact Improv is the most powerful practice I've found for learning how to show up fully. It continually teaches me how to be Present to myself and to others. I've been teaching CI for over 18 years, and have danced with thousands of partners, and love introducing this form to beginners. Couples have benefited greatly with my approach that focuses on connecting through contact. I impart the 'essence' of contact dance; the kinesthetic bond that informs the improvisational movement with another. My approach is simple, safe and semi-structured. This has proven to be a very powerful way to uncover any unconscious patterns that limit expression of genuine, open intimacy, and to resolve and move beyond them. It's truly amazing how simple, direct and effective this method is for expanding one's capacity for, and comfortability with intimacy. Not to mention how fun and delightful it is to rediscover the pleasure of moving and relating in mutual support. Harmony is a life-long explorer of movement & subtle sensation. I've watched her evolve this form, and it is luscious. "Our dance, with power, grace, fun, play. You were teaching me, in moments, how I can hold you more freely, with innate strength just by aligning myself with awareness, in connection to Mother Earth. You taught me from a place of absolute knowing, and maybe it was a basic technique to you, but the presence you had, to see me, to know what I needed and could accept, to show me how I could be a better dancer/lover to a woman; it was exactly what I needed. It felt like love....you were engaging, present, alight and in flight with me. I felt it, I was _so_ there. ... You impacted me, left an indelible mark. You're a milestone in my life." I see Harmony's work as integrating a positive body awareness into the psycho-spiritual health of the human being. Her work also helps us to get and stay in touch with our bodies' natural tendency for well-being, and integrates the body's pleasure in a way that's easy to accept despite our cultural heritage of pleasurephobia."